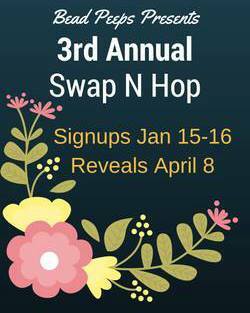 Shaiha's Ramblings: Swap N Hop!! I just love it when a hostess puts together a blog hop where we send beads and other goodies to a partner and we get wonderful things back in the mail. Oh and then we get to create with the beauties sent to us by our partner. It takes a lot of work and I want to thank our hostess Linda Anderson of Bead Peeps! Just a reminder of the the wonderful beads that my partner Bethony Maiden of From The Bead Board sent to me. She actually made the polymer and the clasp. I actually finished my designs a few weeks ago but I wasn't sure if I was going to be able to participate as I couldn't find my pieces. Yeah it is definitely time to reorganize my studio. Luckily I managed to find them last night. Now I am a person that can normally take pretty much anything that a partner sends to me and come up with a design. I am pretty eclectic in my style which isn't necessarily a good thing. Bethony however managed to stump me with the sunflower. I don't work with yellow that much or that bright green so I didn't have a thing to go with it. And it is larger then what I usually work with. So I pondered and pondered. 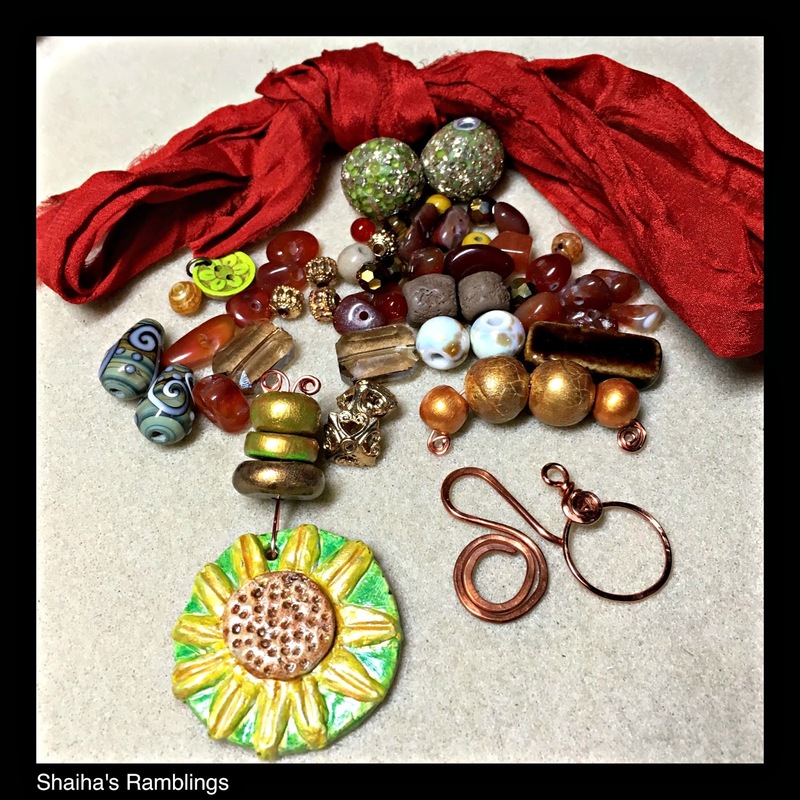 Then I finally asked myself why I was limiting myself to jewelry and I had that A-ha moment. I have friend that really likes sunflowers so I made her a wall hanging. And now I had to do justice to that gorgeous clasp and the gold polymer beads. I also wanted to use some of the sari silk and who can resist carnelian? I ended up with a double strand pearl necklace with some pizzazz. I still have quite a few beads left that will make themselves into other creations. 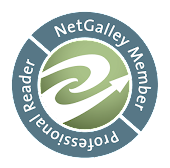 Thank you Betony! Now this is a blog hop so be sure that you have a fresh cup of tea and a cozy seat to curl up on. Now click on this link and it will lead you down to a wonderland of eye candy. Oh wait! Don't forget to leave comment so I know that you stopped by and opinions are always welcomed. Hi Shai, The sunflower wallhanging is truly inspired. It is really beautiful. You are right the pearl necklace has pizzazz. Even though I am not an orange person I would wear it in a heartbeat. Great job using your swap beads. Oh, the wall hanging idea was genius! I bet your friend is going to love it. I know I'm smitten with it! And the necklace is lovely as well. So glad you found them in time to get some pictures taken! ha!! Have fun hopping!! So glad you found them in time to share! As always your designs are fabulous! I was wondering how you would use the sunflower...such a great idea and I'm sure your friend will love it. The necklace is stunning! The peach necklace is my favorite. I love all of the colors together. 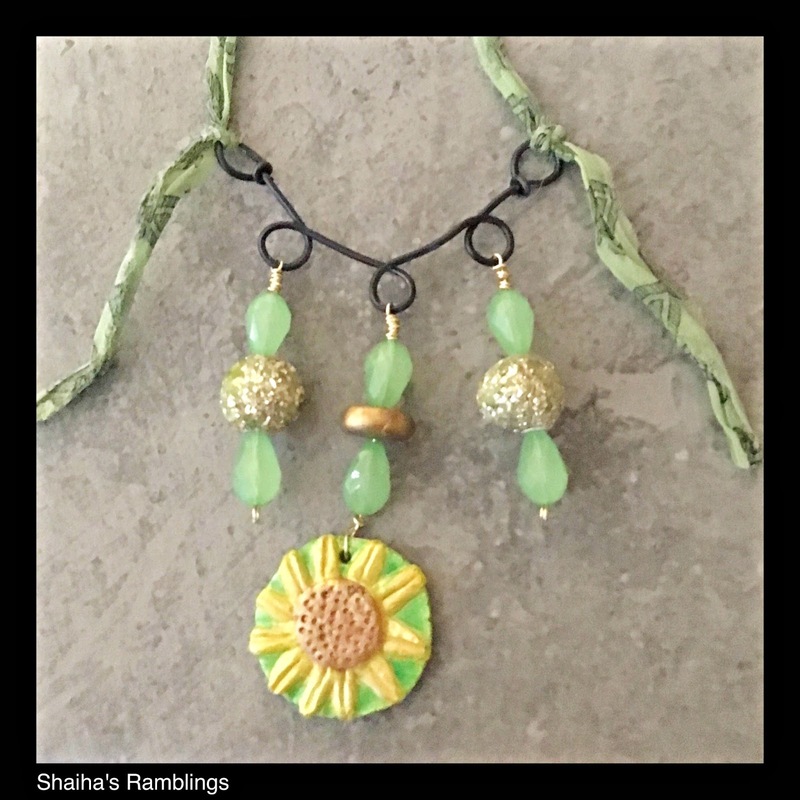 I Love the wall hanging and your necklace is Fabulous!!! It has great color of course but also wonderful texture and movement!!! What a great idea! The sunflower is perfect for a wall hanging. And what a glorious necklace, full of rich colours and warmth. Shai I am so glad that you were able to make something with that ceramic sunflower. I love it is my favorite thing that she sent you and to be able to give it to a friend, I am sure it will make her day. As always your designs are beautiful, wonderful job working out of your comfort zone! I love your wall hanging! Perfect use for that sunflower, cheery and bright. Great idea to make a wall hanging! (I think that'd still be a gorgeous center of a necklace, too!) I also love your silky piece. I don't normally think of gold and red/orange together...but it totally works! GREAT PIECES! I love the wall hanging - it's an accent that can brighten the room! The necklace is beautiful and I think the clasp deserved to be visible! Great work! 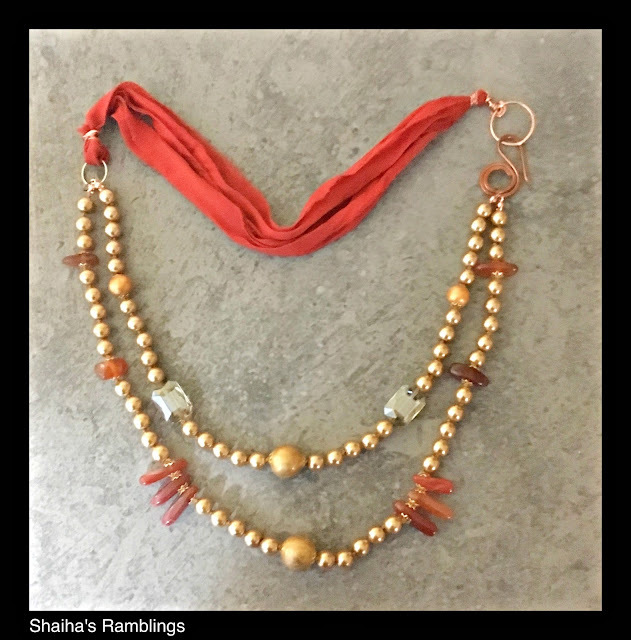 I love all the color combos that you used in the second necklace!